Experts and coffee aficionados agree: a good burr grinder is a crucial component to achieve the ultimate cup of coffee. A burr grinder will improve the overall taste of drip coffee, but it's even more important for specialty brews such as Turkish or espresso, as well as those that favor French press or pour-over coffees. If you don't drink a lot of specialty brews and aren't as picky about your grind as some coffee drinkers are, or just need a grinder for spices or seeds, see our recommendations for blade coffee/spice grinders. There are no grinders -- except a few that are stratospherically expensive -- that get the kind of love that Baratza grinders do. Out of that stellar line up of grinders, the standout model is the Baratza Virtuoso (Est. $230). It's the top pick at TheSweethome.com, where, in testing, it delivers a uniform grind consistency that was comparable to a $2,500 machine. Cale Guthrie Weissman reports that samples from both machines to were sent to their science editor who found they were identical even under a microscope. The Baratza Virtuoso features 40 grind adjustments, and expert testing and owner feedback says the adjustments are spot-on in giving you the kind of coffee you want for a variety of specialty drinks. TheSweethome.com notes that it may not be the best choice for the perfect espresso shot, but plenty of owners say it works just fine for that; a few note that it takes a break-in period to perfect the espresso grind, however. Still, all seem to agree that the Virtuoso is very easy to use, with a simple, intuitive interface that belies its grind accuracy. It's solid, too, like all high-end-Baratza coffee grinders. The one complaint we did see, over and over, about the Baratza Virtuoso is that it's quite messy. While it doesn't retain a lot of grind, according to users, it tends to spill grinds out of the top and onto the counter, more so than other grinders, many say. Still, for the price, users agree that the Virtuoso can't be beat for its superior grind consistency and overall ease of use. Another mid-priced grinder that costs a bit less, and gets reviews that are pretty close to that of the Virtuoso is the . Owners love the Breville's attractive appearance (compared to the fairly utilitarian façade of the Virtuoso) and 60 grind settings that they say delivers a consistent grind from coarse to fine. Testing at TheSweethome.com confirms that, saying, "Our testing showed that the Smart Grinder Pro is indeed very accurate at grind size, particularly at coarse strength." The BCG820BSSXL uses what Breville calls "Dosing IQ" technology to achieve that consistency, automatically choosing the correct amount of beans for the type of coffee you are making. Owners love the wide range of features on the Breville Smart Grinder Pro at this price point. That includes the ability to adjust the grind to suit your taste, and to dose directly into your espresso makers' porta filter. The hopper is also detachable and you can use it to store your beans. While we saw a few complaints of this coffee grinder failing prematurely, most note its sturdy-seeming build and quite a few commend its quiet operation. The lower you go in price for a burr coffee grinder, the lower the ratings tend to be, However, the Capresso 560.01 Infinity Burr Grinder (Est. $90) is a good grinder for the price, reviewers say, and is the budget pick at TheSweethome.com. This Capresso is a conical burr grinder with 16 settings, from espresso to French press, and is widely considered to be a well-designed machine, with users commenting that they especially like how the container holding the grounds fits snugly into the base, which reduces coffee dust. Many also appreciate its slow grinding speed, which helps to preserve coffee flavor and aroma. The Capresso is recommended for automatic-drip coffeemakers, but many call it a good choice for espresso novices as well because it doesn't require the huge investment of an upscale espresso grinder. In fact, TheSweetome.com says, "It's the only sub-$100 electric grinder worth buying, comparable in performance to some $200 machines." A few owners gripe about static electricity build-up, but this seems to be a common problem with burr grinders. The Baratza Encore (Est. $140) is another worthy option. It costs a bit more than the Capresso, but it also comes with the Baratza reputation as a great burr coffee grinder. 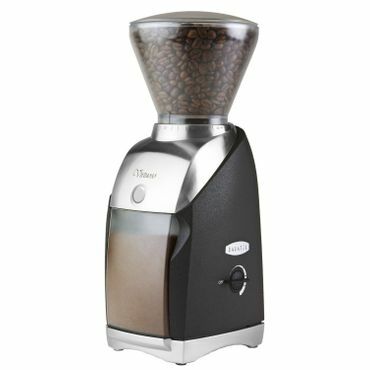 This is a very basic grinder, and most say it's best for those who use mostly medium grinds -- such as for drip coffee makers -- because it's inconsistent at the upper and lower ends of the grinds scale. It's the runner up choice at TheSweethome.com, with even better performance on medium grinds than the pricier Virtuoso. The encore's dosing system isn't terribly accurate, you pulse a gram at a time and that dose can be inconsistent, so at least one expert recommends keeping a scale handy to be sure you're not over or under dosing your pour-over blends. Still, if you long for a Baratza, but don't have a lot to spend, experts say this is a good place to start. Those who went to this grinder from a blade grinder are very pleased with the step up in quality. Some people turn to manual burr coffee grinders because they can't afford electric models. Still others love the ultimate hands on experience that a manual coffee mill offers them. The Hario Ceramic Coffee Mill Skerton (Est. $40) gets ratings from experts and owners that rival those of high-end electric burr coffee grinders for its excellent performance. It's a ceramic burr grinder that many reviewers say is as precise and consistent as electric grinders costing hundreds of dollars more. It's slow, but that slower grind means you don't have to worry about heat transfer to the coffee grounds, which can negatively affect the flavor. However, some say it's too slow, noting that it can take up to six minutes for a full grind, although only about 30 to 45 seconds for a single-cup, pour-over grind. Using this coffee mill takes some muscle, with many reviewers saying this is a good way to build up your Popeye-sized forearms. That means it's not a good choice for those who may have hand or arm weaknesses or grip issues. Still, some people very much enjoy the process, adding that it turns their coffee making into a "meditative experience." There is a learning curve with the Hario coffee mill, but users say that once you get the hang of it, you can get a consistent grind every time. The coffee mill does better, they say, with coarser grinds for pour-over brews or French press, but not as good with finer grinds for espresso and Turkish. It's also got a learning curve for adjusting the grinder; the adjustment process requires partially taking the grinder apart, and then there's no way of knowing if it's adjusted correctly until you actually try grinding the beans -- it's all trial and error. Because the burrs on this grinder are said to rival even commercial grade grinders, if you don't mind manually grinding your own beans, the Hario coffee mill is a great value for everyday or occasional use. Many say they use the Hario coffee mill only for camping or travel, but others note that the glass container makes that impractical due to breakage risks. Others keep the coffee mill around to use in a power outage. Some say that they simply don't drink enough coffee to justify spending more on a grinder, but still appreciate a high-quality grind for a daily pour-over or French press. Hario Ceramic Coffee Mill "Skerton"